For literally thousands of years, the mysterious monuments of Ancient Egypt have haunted the imaginations of the legions of bedazzled foreigners who have come to gaze upon them. In their scope and scale, they seem almost beyond the capabilities of an early human civilisation. It is this intriguing thought that has given rise to so many alternative interpretations of what the ancient Egyptian architecture represents. Why were the Pyramids and Sphinx built? The official word on the major monuments of ancient Egypt is that they were built around 2500 B.C., give or take a few hundred years. Scholars say that the pyramids were intended primarily as burial chambers for the pharaohs. It is believed that, according to the Egyptian religion, life could continue posthumously in some ethereal realm, in a way that partly depended on how the earthly body was treated after death. As well as the more famous great pyramids, a number of smaller pyramids have, in fact, been found, and these were indisputably used as burial chambers. This does tend to back up the burial chambers hypothesis for the great pyramids. The problem is that very few sarcophagi have been found in the pyramids. Undoubtedly, some fell prey to looters, but, even then, archaeologists would have expected to find some remnants of the broken sarcophagi themselves. Although the image of the mummy is popularly associated with Egypt, only one intact body of a pharaoh, that of King Tut, has ever been found. And it was found, not in one of the famous pyramids, but in the Valley of the Kings, allegedly protected by a curse which struck down some members of the team which discovered it. If the pyramids weren’t just memorials to dead pharaohs, then, what were they? Suggestions include astronomical observatories, power stations or spaceship landing platforms. 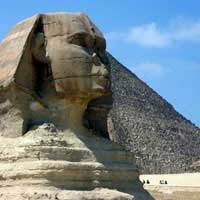 If the pyramids are still a mystery, the purpose of the Sphinx, the giant statue which sits brooding with a humanoid head upon the body of a lion, is even less clear. Some suggest that it, along with the Giza pyramids, once formed part of a vast, and surely awe-inspiring, temple complex. One interesting controversy relates to the age of the monuments. A number of scholars, most notably John Anthony West, have suggested that the Sphinx was not really built in 2500 B.C. at all. Instead, he thinks it may have been built as far back as 36,000 B.C. No civilisation is known to have existed at that time, so such theories pre-suppose that there must have been some kind of primordial super-civilisation, such as that of the fabled Atlantis, which is said to have been lost beneath the waves of a great flood. West, in fact, claims to have seen erosion marks around the edge of the sphinx which, he believes, are indicative of massive flooding in an earlier age. West’s ideas are not popular with the Egyptian authorities, and he has been banned from actively investigating the Sphinx. Modern Egyptians are proud of the achievements of their ancestors, and tend to regard “alternative” theories about the origins of the ancient monuments as implicitly insulting. Are the Ancient Egyptian Monuments a Star Map? The most imaginative theory about the ancient Egyptian monuments has been advanced by Robert Bauval and Graham Hancock. They claim that the monuments collectively constitute a star map, pointing to the constellation of Orion in the sky. Their map is derived simply by plotting the positions of the major monuments on a chart, then comparing it to the positions where the stars would have been as seen from Egypt during ancient times. If it’s a star map, what can it mean? That the pyramids were built by aliens? That early human civilisation was given a helping hand by extra-terrestrials? The questions linger, as do the doubts of some astronomers about whether the alignment between the geography and the stars is as perfect as supporters of the theory claim. Seemingly fantastical theories about ancient Egypt are nothing new. In fact, they have existed for a long time. One of the most famous archaeologists ever to study the ancient Egyptian monuments, Sir William Matthew Flinders-Petrie, was originally inspired to investigate them by a 19th century book which claimed that, in the exactness of their proportions, the pyramids somehow mystically embodied all mathematical knowledge. Upon trying to verify this himself, however, he found that the claims had been based on faulty measurements. Not a bit discouraged, he continued his researches and, in the end, contributed greatly to our knowledge of ancient Egypt. Despite all the research done so far, ancient Egypt still has plenty of mysteries for us to unravel. No doubt the brooding pyramids and mysterious Sphinx will continue to exercise our imaginations, spur our investigative efforts, and challenge our theory-building faculties for a long time to come.